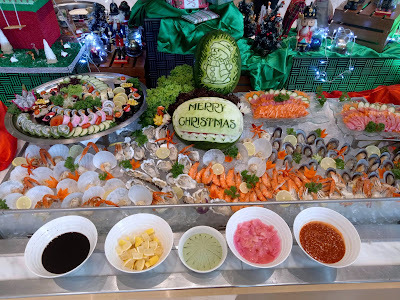 Special offer: Mention "XMAS PENANGFOOD" when ordering to get 15% discount off the regular price of any Christmas buffet. 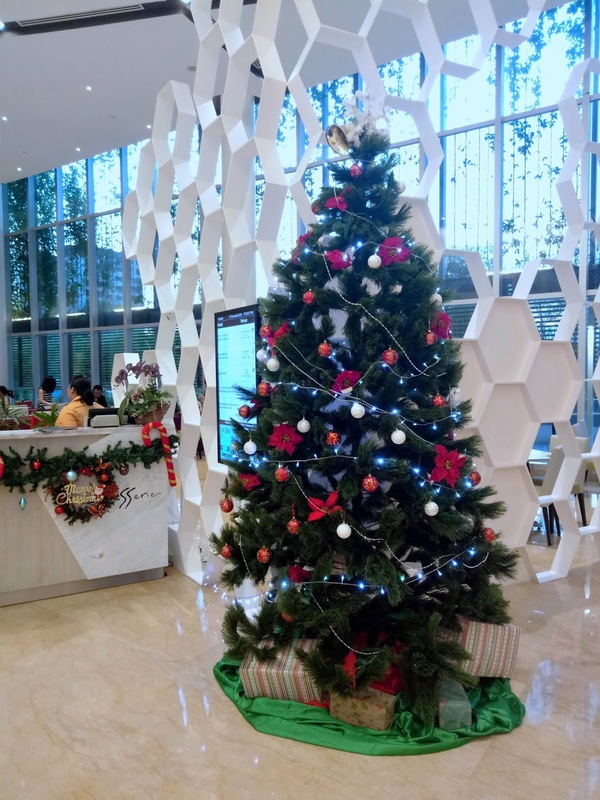 In preparation for the upcoming festive season, Eastin Hotel Penang is showcasing its Christmas promotion this evening. 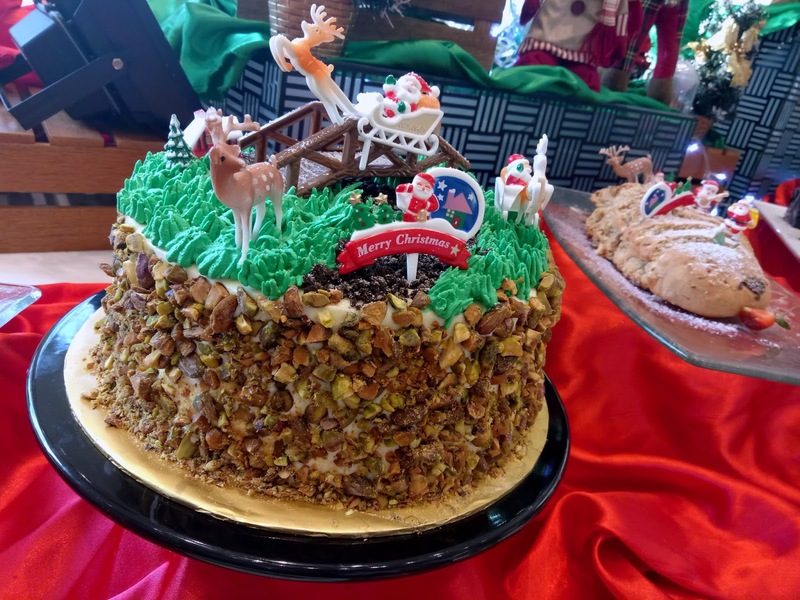 During Christmas, the hotel is having several yuletide-themed buffet sessions at Swez Brasserie, the hotel's all-day dining restaurant next to the lobby. 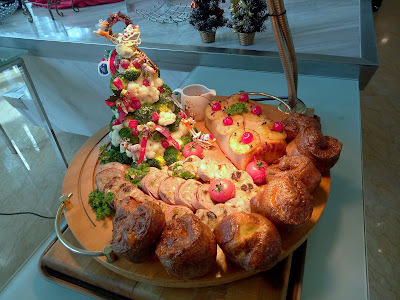 Of course, Christmas dinner would be incomplete without having Christmas Turkey. The plump bird is roasted to golden perfection, and then gently garnished with thyme for the enhanced aroma. Giblet gravy and cranberry sauce are provided as condiments. Christmas Turkey is customarily enjoyed with Chestnut Stuffing. 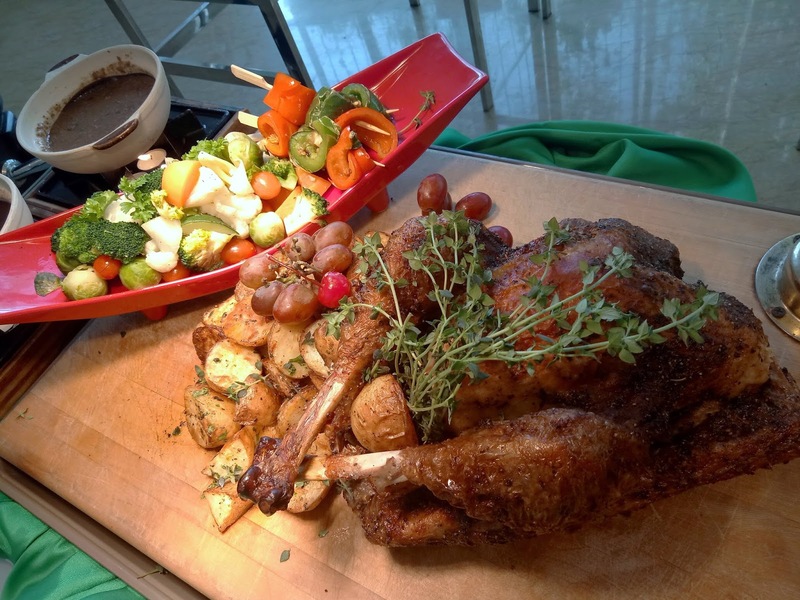 Nowadays, the stuffing is seldom "stuffed" into the bird, but is instead cooked separately. As per tradition, Chicken Meatloaf and Yorkshire Pudding are available too. 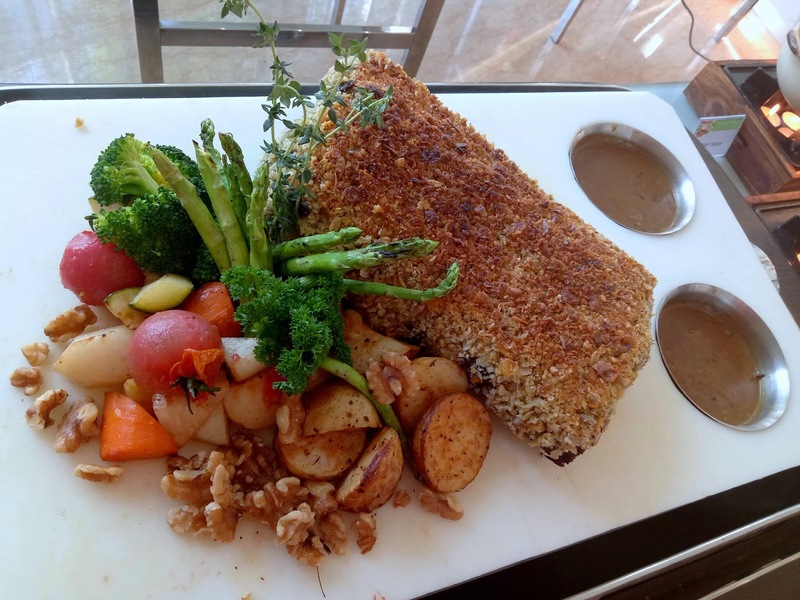 Another interesting delicacy at the carving station is Roasted Striploin. The beef is coated with crispy crust in order to keep its natural juice intact. The striploin is paired with savory mushroom sauce, grilled vegetables, baked baby potatoes and walnuts. 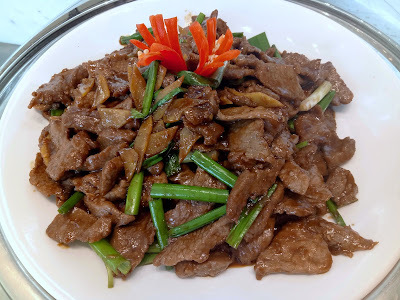 Among the hot dishes, I am most fascinated with the Wok-Fried Venison. Venison, or deer's meat, is tougher than beef but is arguably tastier. The slices of meat are sautéed with ginger and scallions à la Chinese cooking. I am impressed by the fact that the venison does not have the "raw" smell that many people are uncomfortable with. Another peculiar dish this evening is Stuffed Squid. In this dish, cooked squid rings are filled with "otak-otak", a blend of fish and spices. 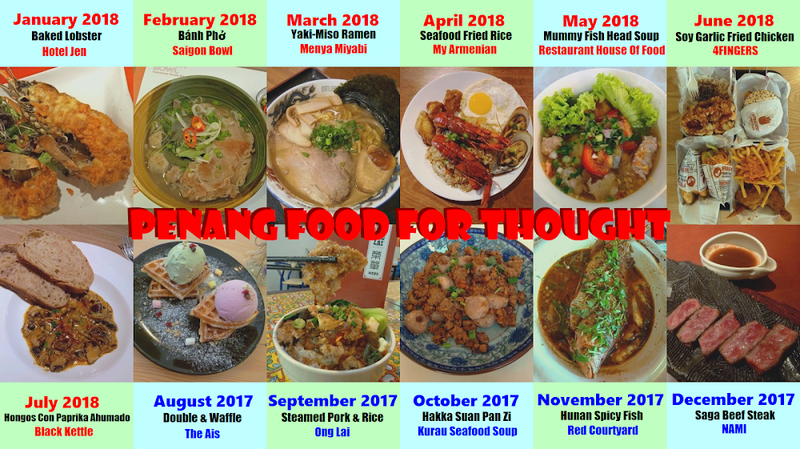 The overall taste is mouthwatering indeed. 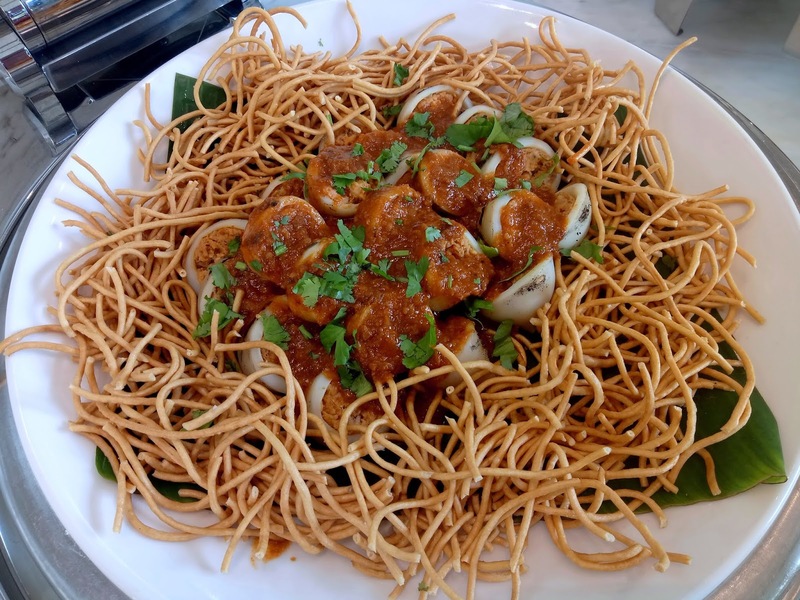 As for the presentation, the squid rings are served over a bed of crispy egg noodles. 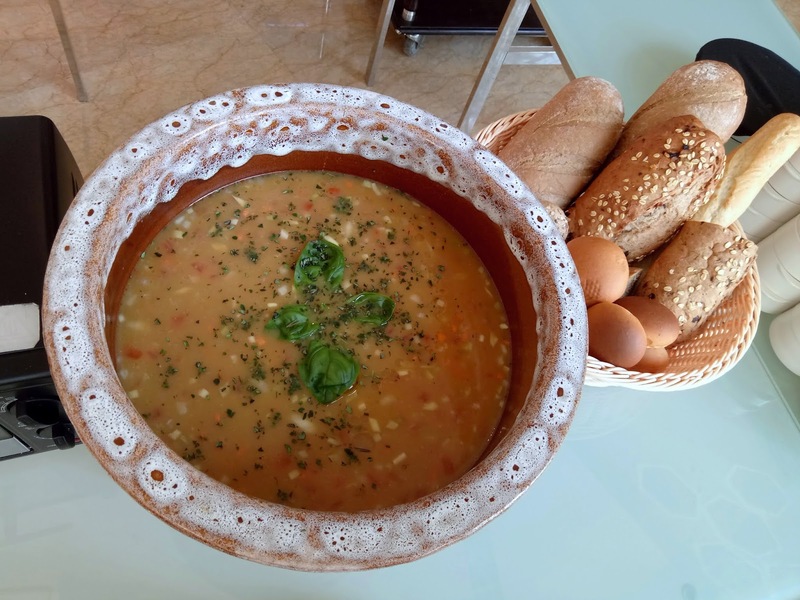 Seafood Bouillabaisse is a traditional stew from Provence. This French delicacy was originally created to use unsold seafood from the market. Of course, today's stew uses premium seafood ingredients like oysters, scallops and squid. The Seafood Bouillabaisse goes well with garlic bread and is highly recommended. Moving to the salad section, diners can mix their own salads using fresh vegetables and a variety of dressings. Personally, I prefer the Italian Mushroom Salad and German Potato Salad. 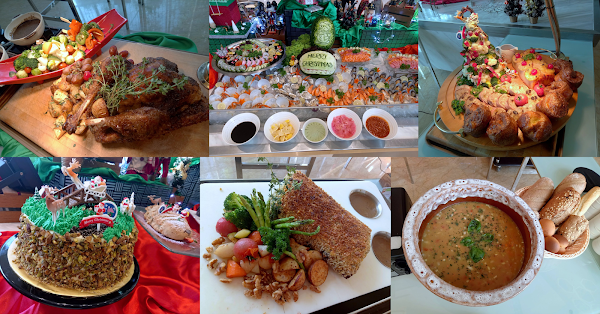 The Chicken Terrine and Seafood Terrine are scrumptious too. Diners who enjoy seafood on ice can help themselves with blue crabs, shrimps, green-lipped mussels, oysters and scallops. Cocktail sauce is provided. 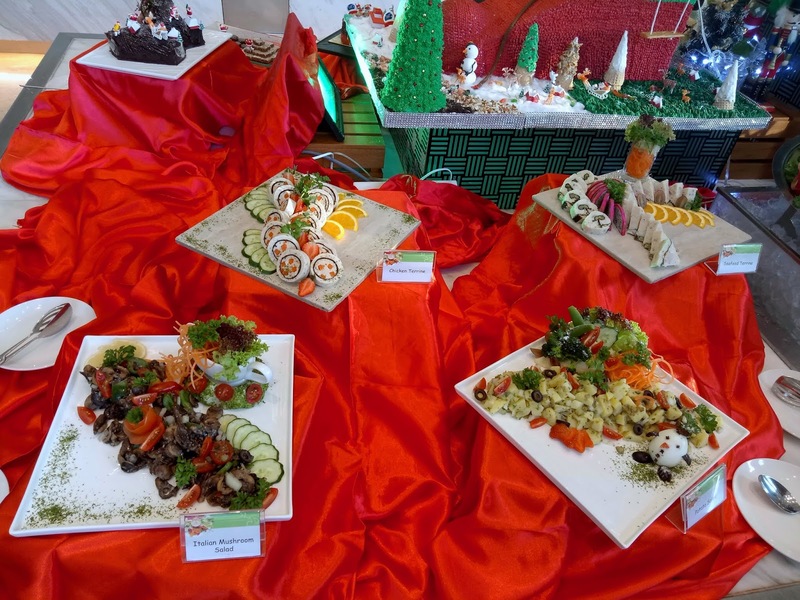 In addition, diners can also indulge in platters of sushi and sashimi. The presentation of fruits is pretty appealing; I appreciate the extra mile that the kitchen staff went through to take this happen. 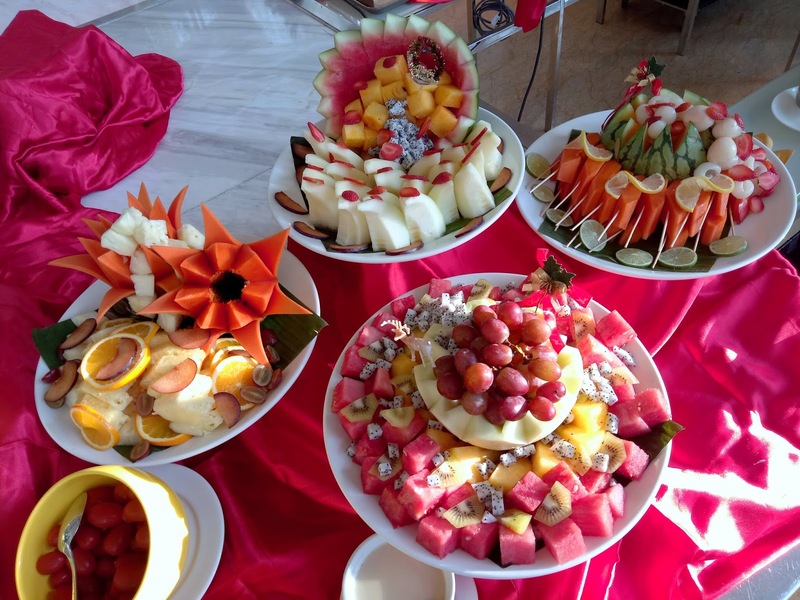 Fruits that are prepared today include papaya, honeydew, pineapple and watermelon. 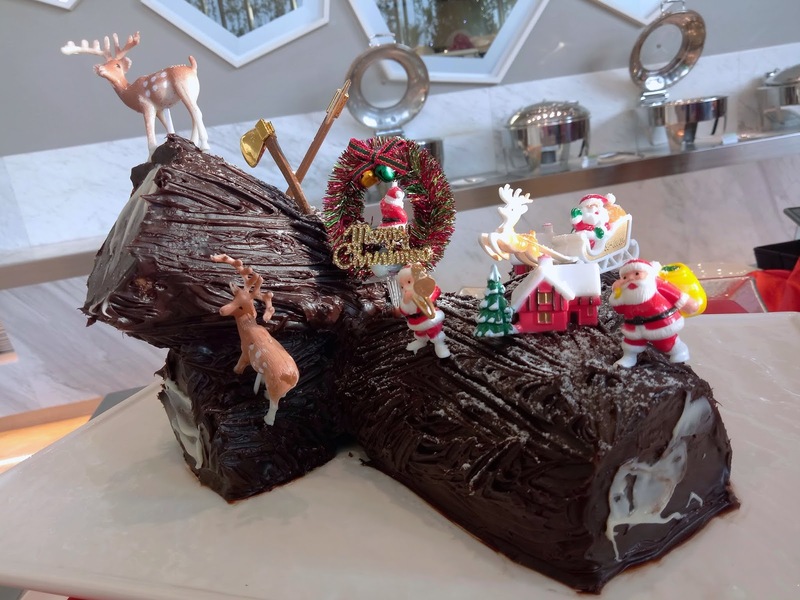 At the pastry counter, the Black Forest Cake steals the spotlight with elaborate icing on top. Crushed pistachios on the side serve to provide extra crispiness. Other Christmas confections that the hotel prepared today are Christmas Cookies, Stollen, Christmas Pudding and more. Of course, Christmas Yule Log Cake is an integral dessert in a traditional yuletide feast. The cake is meticulously decorated such that it resembles an actual Yule log. For instance, the chocolate icing is raked with a fork in order to mimic the rough texture of tree bark. 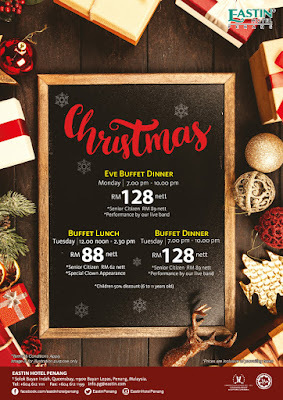 Eastin Hotel Penang serves 3 buffet sessions in total: Christmas Eve dinner, Christmas Day Lunch and Christmas Day Dinner. The adult price is RM88.00 net for lunch and RM128.00 net for dinner. 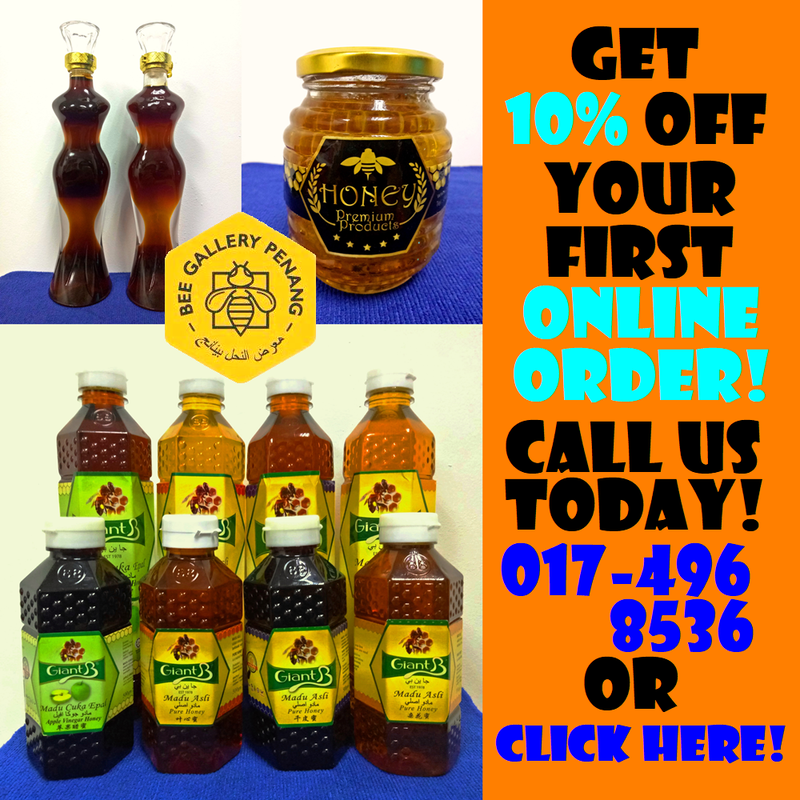 There are discounted prices for children and senior citizens. On both evenings, a live band will be performing Christmas songs to entertain diners. As for people who prefer to celebrate Christmas at home, the hotel is also offering take-out Christmas Turkey for RM338.00 net. 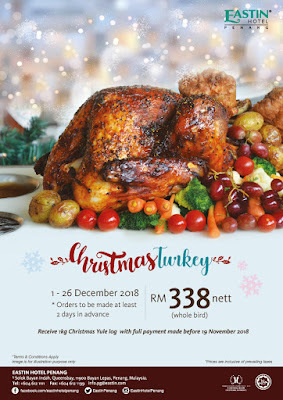 This promotion is available until 26 December 2018. Orders need to be made 2 days in advance.